This beautiful American pelicinid female uses her remarkably long abdomen to lay eggs on grubs in the soil. In a classic fairly tail, Little Red Riding Hood notices the remarkable size of her Grand Mother’s teeth. Unfortunately, Grandma is a wolf and Red soon has a much closIer look at the fangs than she might have imagined. In this week’s bug of the week tale, the rejoinder to “What a long tail you have little wasp” is “All the better to sting you with my dear”. For you see, the wolf in our tale is the American pelicinid wasp, Pelecinus polyturator and Little Red Riding Hood is the larva of May beetle about to be parasitized. White grub larvae such as this one are the food for the developing larva of the pelicinid wasp. The American pelicinid holds a unique place among its other waspish relatives in that it is the only species in its genus and family to be found in North America. It is quite rare to observe one in the wild and rarer still to capture one on film. The female American pelicinid spends much of her time in the woods searching the forest floor. Using cues that we do not fully understand but reckon to be sounds or odors, the she-wasp detects the location of the beetle grub in its subterranean lair. She thrusts her remarkably long abdomen into the soil, finds the beetle grub, and deposits and egg on the skin of her victim. The May beetle is the adult stage of the grub attacked by the American pelicinid wasp. The egg hatches into a larva and this tiny maggot-like insect bores its way through the skin of the beetle grub. Once inside, it consumes the grub, alive, from the inside out. When it has completed its development, the larva molts into a pupa and remains underground. 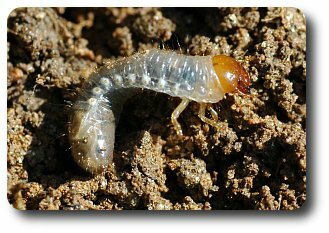 The transformation from larva to adult takes place in the pupal case and soon the pelicinid wasp emerges from the soil to feed on nectar, find a mate, and begin the hunt for beetle grubs. The American pelicinid is most often seen near the floor of deciduous forests in the eastern United States in the late summer and early autumn. They are sometimes found in gardens and pastures feeding on flowers or resting on foliage. I give many thanks to Judith for her amazing picture of an American pelicinid wasp that was the star of bug of the week. If you have an image that you would like to contribute, or a request, please send it to me at mraupp@umd.edu and I may be able to share its story in a future bug of the week.